Your name will appear next to your review or comment, visible to everyone. We (Drury Tea & Coffee Co Ltd) also save your IP address as a security precaution, but in can only be viewed by our staff. It will remain in our system until you withdraw your consent. If you’d like to have your personal data removed, send an email to orders@shopdrury.com. This espresso coffee is very well suited to lattè and cappuccino, where its punch cuts through the milky creaminess, this richly flavoured blend also lends itself to espresso and Americano. I very much enjoyed these beans as espresso. Very smooth with little acidity and rich without it being too 'dark' on the palate. Recommended indeed. I have been using Drury Classico Espresso coffee beans for many years, excellent product have tried lots of different coffee beans but nothing compares to these. Good strength for either latte, cuppacino, americano and expresso. 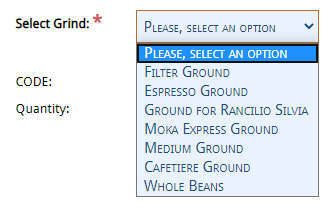 When purchasing coffee from us, it is important to select the right grind for your coffee making equipment. You may ask why is this so complicated. The answer is that generic grinds that you get in supermarkets are not design to get the best flavour for your brew. The various options are listed below. Fine Ground for domestic filter machines (perculator or drip) eg. Krups, Melitta. Perfect for all electric and lever domestic espresso machines. The Rancilio Silvia is an incredibly powerful machine and so needs a finer than standard grind. Please Note. That we do test our grinds but it can be out by a slight margin and this margin can have a major effect in the way the coffee pours. We usually recomend the purchase of a grinder to sit by the Silvia. For stove top espresso makers. Usually used for commercial pour over machines or old style Cona brew perculators. Also known as french press or plunger coffee makers. Coarse ground. For people who have their own grinders. Buying in the bean and then grinding when the coffee is needed ensures the freshest possible brew. The Aeropress is a unique way of making coffee and gives you the flexibility using quantity of coffee, the grind and the pressure you exert. So when selecting grind for the Aeropress it is your choice from Espresso to Cafetiere ground.